Oxford Lab Products BenchMate 10 Liter Magnetic Stirrers (MS-10XL) are large capacity laboratory magnetic stirrers that have a compact magnetic stir plate design, with a low aspect ratio of just 29 mm thick and an adjustable speed from 200 rpm to 2,200 rpm in steps of 100 rpm. The top surface of the Oxford Lab Products BenchMate 10 Liter Magnetic Stirrers is made of robust stainless steel and is resistant to moderate contamination with harsh chemicals. 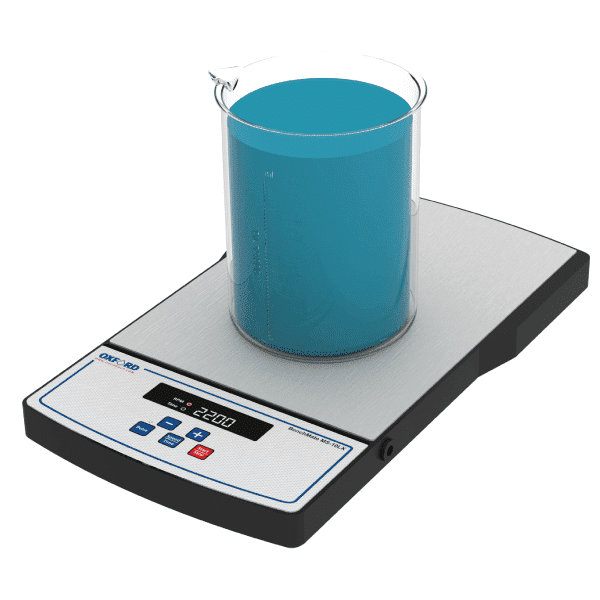 The Oxford Lab Products BenchMate 10 Liter Magnetic Stirrers are also water spill resistant (IP 44 compliant). Equipped with a modern real-time digital display, the Oxford Lab Products BenchMate 10 Liter Magnetic Stirrers show the current speed and time settings on the display in real-time. The unit has a timer range of 1 – 999 min and infinite mode. Looking for a High Capacity Hotplate Stirrer? Check out the Oxford Lab Products BenchMate 10 L and 20 L Digital Hotplate Stirrers. Brushless DC motor for quite operation and a maintenance-free long product life. Adjustable speed from 200 to 2,200 rpm in steps of 100 rpm. A stirring capacity of 10 liters with a timer range of 1 – 999 min and infinite mode. Corrosion resistant stainless steel top surface for better chemical resistance and IP 44 compliant design. Includes a high strength magnetic stirrer bar (35 mm). Pulse mode for homogeneous mixing in clockwise and counter-clockwise directions. Microprocessor controlled stirrer with last run memory function. Low aspect ratio just 29 mm thick. Software-driven gradual acceleration with universal power supply. © 2017 Oxford Lab Products.